First let me say thank you to all those Veterans (and their families) out there who have sacrificed so much for our America. Thank you!!! .Last year’s post included a comprehension worksheet detailing the history and significance of Veteran’s Day so be sure to check that out too! Looking for more Veteran’s Day fun? Here’s a cool website for kids (published by Veteran’s Affairs) called VA Kids. It’s got activities, facts and games for kids K-5th. 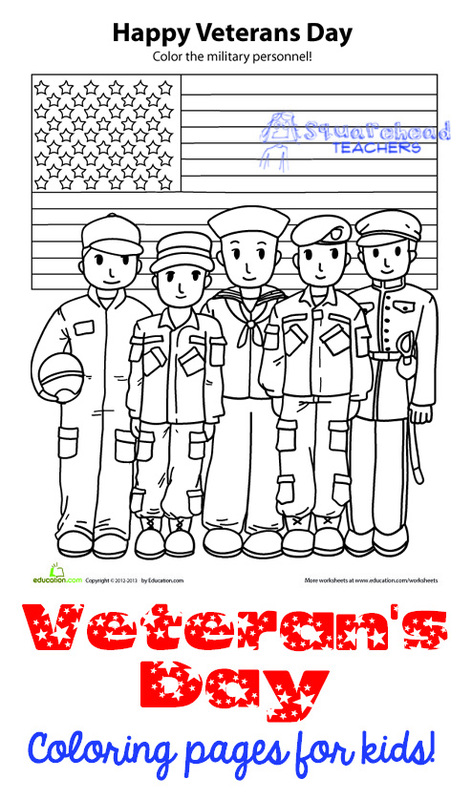 Kids Connect also has a great page about Veteran’s Day. Enjoy! This entry was posted in American Hist./Patriotic, Art/Crafts, Holidays/Seasons and tagged America, Children, Education, Elementary School, Homeschool, Kids, Teacher Resources, Teachers, Teaching, Veteran's Day by Squarehead Teachers. Bookmark the permalink. Oh, this is great! I was wanting to do something theme related for Veteran’s Day. My daughter loves to color, so I’m going to use your color sheets and links for our homeschool. I think we’ll send them to dad’s job (Army) to post on the bulletin board! Thank you! Awesome! Send him my thanks as well!